Sales orders coming in via fax or email represent a roadblock for companies who want to modernize order processing. 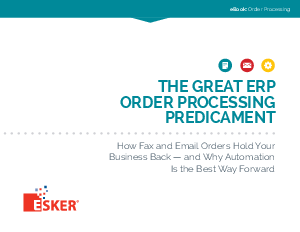 Rather than deal with paper or force customers to EDI, this eBook highlights the benefits of using one platform to automate order processing in ERP, while allowing customers to send orders as they please. For more and more companies, it’s the perfect solution to the great order processing predicament.